Beach House Do outro lado da rua do Powerhouse Park e praia !!! vista para o mar e espaços interiores e exteriores bem decorados, em uma privilegiada localização Del Mar! A poucos passos da areia, Powerhouse Park, uma variedade de bares, restaurantes e lojas ou desfrutar de seu café da manhã na espaçosa varanda com vista oean. Dispondo de uma casa de praia chique, com 4 quartos e 2. 5 banheiros, garagem para 2 carros, além de 2 espaço de estacionamento adicional. NÃO PERCA um período de férias em uma das melhores localizações em Del Mar! Great location. Perfect for families. We had a wonderful time. It takes about 2 minutes to walk to the beach. Surpassed our expectations. Thank you! We loved our stay in Del Mar! We loved our stay in Del Mar! Perfect location and gorgeous house with all the amenities! Layout of the house was nice for a large group and a separate spot downstairs for kids to relax and play. Beautiful sun deck overlooking ocean with gas fire pit and hottub in a private area in the back. We loved all the extras bikes, surfboards, boogie boards, weightbench, washer & dryer, dog kennel and many more. Would definitely recommend and cannot wait to come back hopefully soon!! Thank you for the reveiw, Carrie. Incredible views, insane location, recently renovated, nicely appointed! Views of the ocean, great walkable location to town, next door to lovely parks and beaches. Close to Solana Beach, Encinitas as well as Del Mar and the greater San Diego area. Only drawback to this house is the train going through the back, owner is awesome and provides earplugs. House is clean and comfortable, lovely kitchen, hot tub is nice, we would definitely return! Great location! We love Del Mar and specifically this area. We would have liked better communication as the previous reviewer stated (tv info, speakers, home entry etc). The house was not in tip top shape (required additional cleaning, had a huge ant problem, dated/broken outdoor furniture and some minor matienence issues). It would have been helpful to know the train (several per hour) pass in the actual backyard of the property- but we ended up getting used to it. Overall, the space (layout/ bedrooms) and location are great. Location alone sells this house! 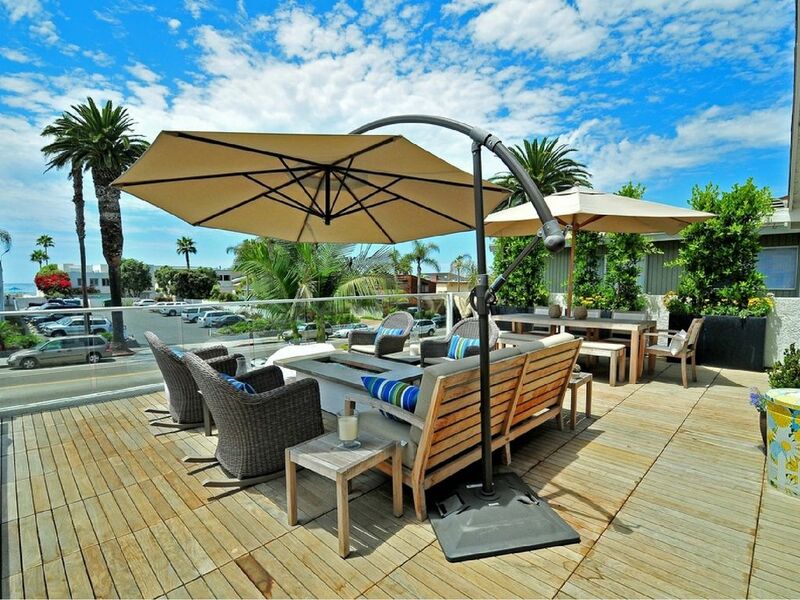 Literally a few steps from the amazing Del Mar beach and town. Cute decor and garage stocked with goodies: surf boards, bikes and washing machine. The upstairs deck is in full sun, furniture and bbq are sun kissed and not in mint condition. House has some ants. Bathrooms are nice and matresses are comfy. The train noise is part of the Del Mar charm! We enjoyed our stay! Sea World, um jogo de Padres em Petco Park, Legoland, os carregadores, o Jardim Zoológico de San Diego, Balboa Park, Torrey Pines, Dog Beach, La Jolla Cove, mas principalmente a bela Del Mar !! There are train tracks behind the home and the road is busy on beach days. Also, AC only in the master bedroom. Spa is cleaned on Fridays.